"Swing In" the New Year with the One and Only Tommy Dorsey Orchestra! The first show is a concert from 6:00 PM - 7:30 PM. The second show is a concert and dance party from 9:30 PM - 12:15 AM, and will include party favors and a champagne toast at midnight. The Franklin Theatre will ring-out the old year and “Swing-In” the new with a distinctive evening and rare middle Tennessee appearance by the one and only Tommy Dorsey Orchestra. The theatre opened its doors to the public in 1937 on Franklin’s historic Main Street. To honor the era that first welcomed the theatre, the evening will promise 1930s swank with a 21st century flair featuring two performances by this legendary dance band. No group in Big Band history can get a crowd swinging like the Tommy Dorsey Orchestra! Known as the “Sentimental Gentleman of Swing," Tommy Dorsey was a master at creating superb dancing and listening arrangements. Tommy’s work included collaborations with the likes of Paul Weston, Axel Stordahl and Sy Oliver, and showcased singers who could project them brilliantly; most notably the leader of the Rat Pack himself, Frank Sinatra. The music world lost Tommy at an early age, but his legacy of great music has transcended time. 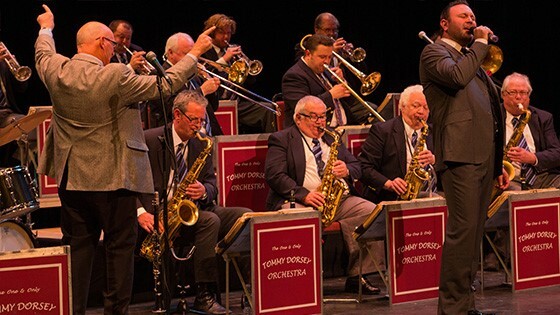 The Tommy Dorsey Orchestra repertoire continues to entertain audiences of all ages throughout the world. Sponsored by Jackson National Life.